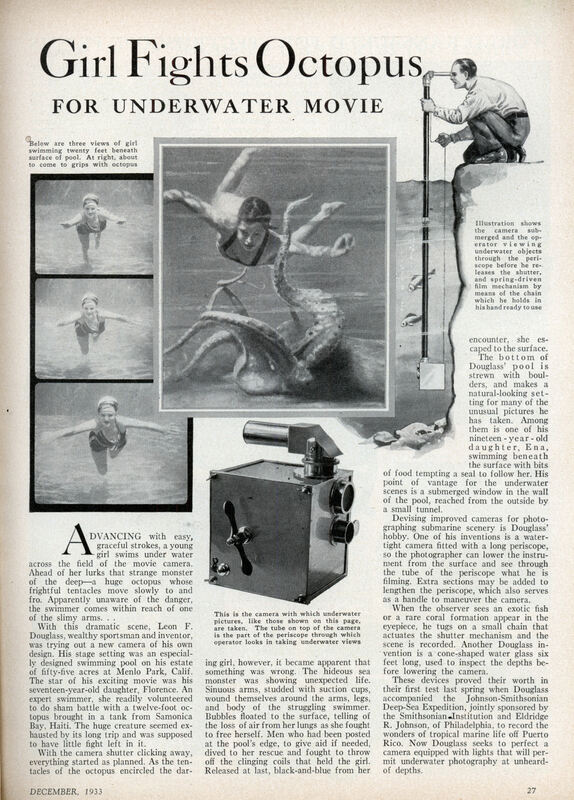 ADVANCING with easy, graceful strokes, a young girl swims under water across the field of the movie camera. Ahead of her lurks that strange monster of the deepâ€”a huge octopus whose frightful tentacles move slowly to and fro. Apparently unaware of the danger, the swimmer comes within reach of one of the slimy arms. . .
With this dramatic scene, Leon F. Douglass, wealthy sportsman and inventor, was trying out a new camera of his own design. His stage setting was an especially designed swimming pool on his estate of fifty-five acres at Menlo Park, Calif. The star of his exciting movie was his seventeen-year-old daughter, Florence. An expert swimmer, she readily volunteered to do sham battle with a twelve-foot octopus brought in a tank from Samonica Bay, Haiti. The huge creature seemed exhausted by its long trip and was supposed to have little fight left in it. encounter, she escaped to the surface. The bottom of Douglass’ pool is strewn with boulders, and makes a natural-looking setting for many of the unusual pictures he has taken. Among them is one of his nineteen – year – old daughter, Ena, swimming beneath the surface with bits of food tempting a seal to follow her. His point of vantage for the underwater scenes is a submerged window in the wall of the pool, reached from the outside by a small tunnel. 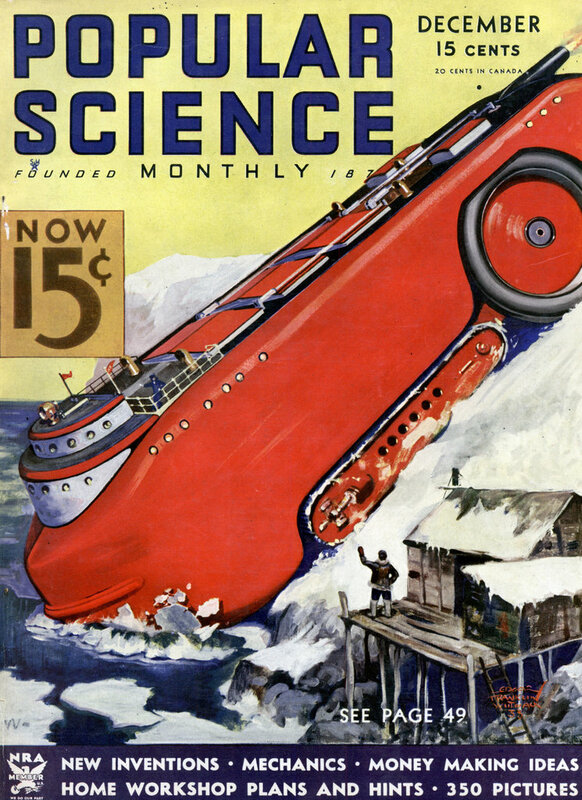 Devising improved cameras for photographing submarine scenery is Douglass’ hobby. One of his inventions is a watertight camera fitted with a long periscope, so the photographer can lower the instrument from the surface and see through the tube of the periscope what he is filming. Extra sections may be added to lengthen the periscope, which also serves as a handle to maneuver the camera. When the observer sees an exotic fish or a rare coral formation appear in the eyepiece, he tugs on a small chain that actuates the shutter mechanism and the scene is recorded. Another Douglass invention is a cone-shaped water glass six feet long, used to inspect the depths before lowering the camera. These devices proved their worth in their first test last spring when Douglass accompanied the Johnson-Smithsonian Deep-Sea Expedition, jointly sponsored by the Smithsonian-Institution and Eldridge R. Johnson, of Philadelphia, to record the wonders of tropical marine life off Puerto Rico. Now Douglass seeks to perfect a camera equipped with lights that will permit underwater photography at unheard-of depths. Octopi are very timid creatures and would not do well in a chlorinated pool. And they brought it from the Caribbean to Northern California? How? by train? Ship? But look closely at the pics, in the 3 on the left she’s wearing a swim cap but in the ‘encounter’ one she’s not. Also the straps on the bathing suit do not seem to match. It also appears in the above page that she’s wearing a bathing suit for the encounter. In the efootage clip, she’s fully clothed, right down to tennis sneakers, when the octopus has her. Why would she be dressed for a swim in the pool? Unless the octopus pulled her in? Some major inconsistencies here. It also should be noted that an octopus can aggressively defend its territory against ‘invaders’. It probably laid claim to the pool and attacked the girl for invading its space. OK, apparently it was his other daughter with the seal in the clip. This wasn’t clear from the text above, only by reading the original article above (the copy) However, Florence was still nice looking ‘prey’ for the beast.